The Connecticut Department of Transportation will conduct a public meeting from 7 to 8:30 p.m., Wednesday, Oct. 24 about the proposed Stamford Transportation Center parking garage to be constructed on South State Street in Stamford. The meeting will be held in the Senior Center Auditorium on the second floor of Stamford Government Center, 888 Washington Blvd., Stamford. — This article combines announcements from the Connecticut Department of Transportation (which, weirdly, didn’t state the time of the meeting) and the state Council on Environmental Quality (which did, and which had other information). The proposed parking garage will replace parking in the aging original garage structure (currently located on Station Place) with a low maintenance, long service life facility that meets the demand for state-owned commuter parking spaces located proximate to the station. Parking will be maintained in the original garage structure throughout construction of the proposed garage to help minimize commuter parking impacts. The original garage will be closed upon completion of the proposed garage and will be demolished in the future under a separate construction contract. Map showing the train station and the location of the present parking garage and the proposed one. 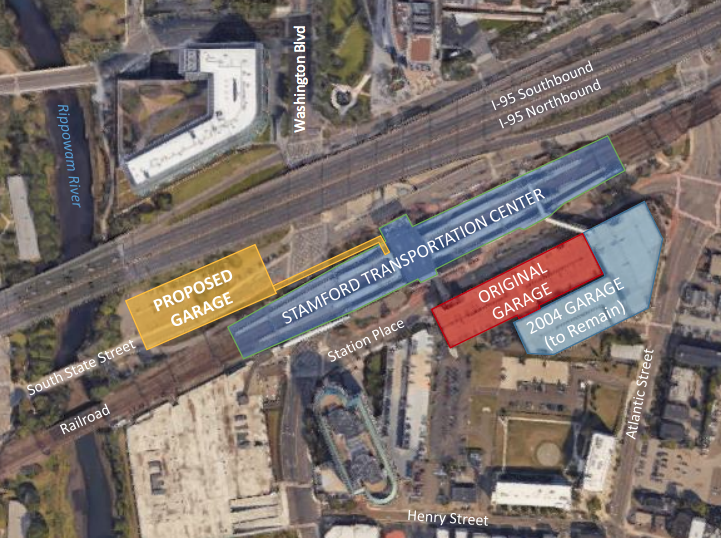 As proposed, the garage will be connected to the station via an enclosed pedestrian bridge over Washington Boulevard. The proposed project site is on state-owned property bounded of the south by Metro-North Railroad right-of-way, on the east by Washington Boulevard, on the west by the Rippowam River, and the north by I-95. The site is partially occupied by an existing surface parking lot for the STC. The proposed garage will be connected to the station via an enclosed pedestrian bridge over Washington Boulevard. The proposed garage will provide approximately 960 commuter parking spaces, resulting in a net increase of approximately 130 state-owned spaces at the station. The proposed parking garage and pedestrian bridge to the station will be advanced to design and construction as a design-build project, which is planned to begin in 2019. Minimizing and managing commuter disruption and commuter parking impacts during the construction of the proposed parking garage. The Department previously pursued a new parking project for the STC as part of a transit-oriented development (TOD). 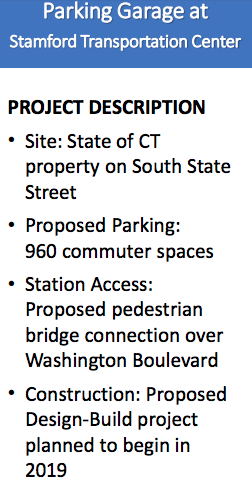 The current proposal is not a TOD project. Under this previous effort, the Department completed an Environmental Impact Evaluation in accordance with the Connecticut Environmental Policy Act (CEPA) to evaluate and document the potential environmental impacts of the project and to outline recommended mitigation for those impacts. The EIE (dated August 2012) is available here for information. The Department issued a Record of Decision (ROD) in December 2012 and the Office of Policy and Management issued a Determination of Adequacy in January 2013. The ROD and Determination of Adequacy are available here. As part of the current project effort, the department will be conducting a new early public scoping process in accordance with CEPA. The public scoping meeting will be conducted in conjunction with the public information meeting on Oct. 24. The public information meeting is being held to afford a full opportunity for the public’s participation and to allow open discussion of any views and comments the community may have prior to progressing the proposed project into the Design Phase. Written comments from the public are welcomed by the Connecticut Council on Environmental Quality and will be accepted until the close of business on: Wednesday, Nov. 7, 2018. The meeting facility is ADA accessible. Language assistance may be requested by contacting the Department’s Language Assistance Call Line at (860) 594-2109 requests should be made at least five business days prior to the meeting. Persons with hearing and/or speech disabilities may dial 711 for Telecommunications Relay Service (TRS) and must instruct the operator to contact (860) 594-2243. Language assistance is provided at no cost to the public and efforts will be made to respond to timely requests for assistance.